You are in: About Spain is More - Northern Spain Travel Agent > Find Your Way to Santiago > Other Travels > Transcantabrico****: 6 days of Luxury Travel through Northern Spain. Transcantabrico Clasico: From Santander along the Green Coast to Bilbao and through the mountains to León. One of the worlds best Train experiences. Along the same tracks that the historic Robla Railway ran, carrying cars full of coal from the mines in León to Biscay, the Transcantabrian began its career in 1983. And, so one hundred years after the legendary Orient Express, the first Spanish tourist train was born. The Classic Transcantabrian Train takes the traveler back to that golden age of great railway journeys while he or she is still able to enjoy all the comforts and modern conviences of the twenty-first century. Its rooms and suites, carefully remodeled and acclimated display its full majesty in rail travel. In an evocative and pleasant atmosphere, a first-class crew will introduce you to the rich culture and cuisine of Cantabria, País Vasco and Castilla y León and provide the foundation that makes every Classic Transcantabrian trip a genuine pleasure for all the senses. On this trip you travel from Santander to León, a journey through Spanish history, from prehistoric times to the present. You personally get to know the Northern Coast of Spain, bordering the Cantabrian Sea. You experience Northern Spain's steep mountains cliffs and green meadows, beaches, and joyfully discover many towns and villages along the way. Every new place such as Santillana del Mar, Santander, León, Bilbao…is full of charm, vitality and history, each a work of art transformed through the centuries. 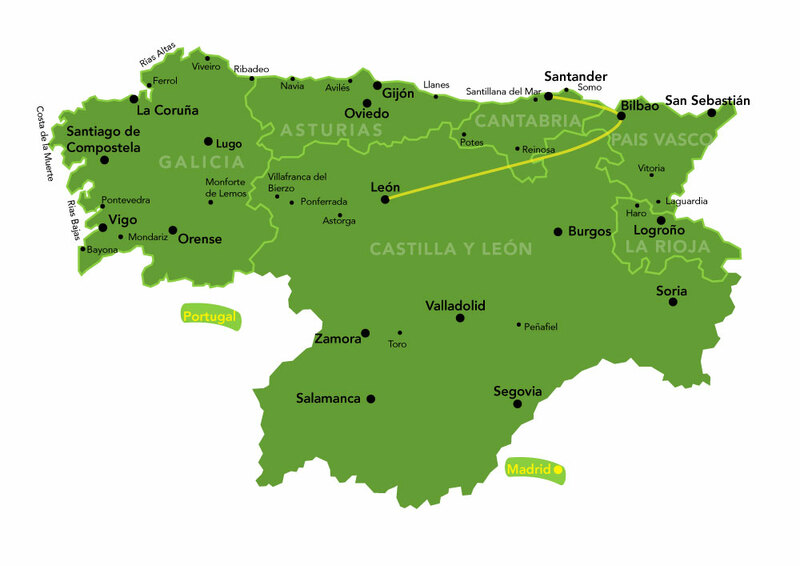 The train goes for 4 days and 3 nights from Santander to León or vice-versa. We combine this train trip with 1 night in Santander and 1 night in León. We are sure that you will enjoy the culture, art, scenery, gastronomy and, of course, the pleasure that this train offers. Finally, on your own, you can enjoy the magnificient seaside stroll and delicious cuisine in Santander. In addition you can admire the Cathedral, the Parador of San Marcos, Basilica of San Isidoro, Gaudí's House of Botines and enjoy the incredible tapas and atmosphere of the city. In the morning transport to the village of Santillana del Mar. You continue your trip in the direction of Bilbao, the most populous city in the Basque Country, a town full of dynamism that has managed to reinvent itself after the decline of traditional heavy industry. The visit includes the entrance to the famous Guggenheim Museum, a symbol of the new Bilbao that combines tradition with modernity. After lunch you will enjoy more free time. Dinner and overnight in Villasana de Mena / Mercadillo. The first visit of the day will take you into Castilla through the stunning scenery of Valle de Mena. The morning will feature the Romanesque Palentino, with three towns that have been preserved as authentic Spanish jewels: Villalcázar of Sirga, Carrión de los Condes and Frómista. You will have a traditional lunch and then visit the Roman Villa of La Olmeda, in Saldaña, with its magnificent tiled mosaics. Return to the train and travel to Cistierna, where you will have dinner and spend the night. You arrive to San Feliz while finishing your last breakfast on board. The Transcantabrian Bus will be waiting to take you to León. Visit this historic city full of treasures, whose Old Town with surely surprise you, with spectacular sites like the Basilica of San Isidoro, the stunning Cathedral of León and the Parador of San Marcos. Your trip ends after this visit. You will stay the night at a four star hotel in the center of Leon, so you can further take the opportunity to get to know this beautiful and charming city. After breakfast you will catch the train toward Madrid Chamartin (included). 5x nights in a train suite compartment/double room - 2x nights in lovely hotels (León and Santander) and 3x nights on board Transcantabrico*. 3x dinners and 3x lunches with typical dishes from different regions during train tour (includes wine, coffee and liqueurs). Transport from Madrid to León by train (or León - Madrid). Transport from Santander to Santillana del Mar. The price includes 1 Spain-is-More-Travel Guidebook in English with recommendations, itinerary, guides, maps, directions...(only one per group of 4). More copies can be purchased when booking for 20€ per copy, or 30€ per copy if you make the request less than 6 weeks prior to departure. Transportation from Madrid airport to train or bus station in Madrid (included with train ticket - otherwise taxi 30€). Transportation from Santander to the local airport (taxi aprox. 21€). Transport between train station in León and hotel (taxi aprox. 7€). Extended stay in Madrid, León and Santander or elsewhere can be arranged.